Unsubscribing from the weekly Ask Leo! newsletter is easy. All it takes is two, maybe three clicks. I no longer wish to receive your newsletter. How do I unsubscribe? Unsubscribing is easy, all you need to do is click a link, and then click an option on the resulting page. 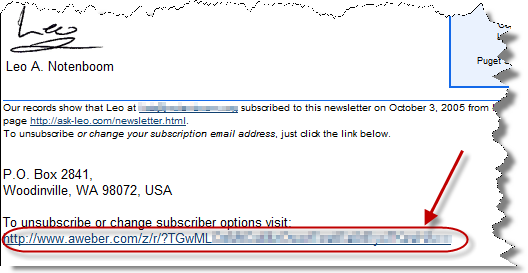 To unsubscribe, click the highlighted link. Click on the Unsubscribed option, and then on the Save My Subscriber Settings button underneath. « Previous post: Why am I sometimes not getting your newsletter?